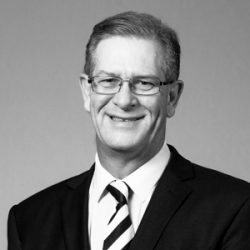 Robert Sadler practiced as a solicitor in commercial litigation for over 14 years before accepting an appointment in 1995 as Chief Executive of Central Highlands Water Authority. Rob returned to legal practice and the bar in 2001. Rob has extensive experience in contract and general commercial disputes and in water, local government planning and environment matters. He practices before the Magistrates, County and Supreme Courts and Tribunals particularly VCAT. Rob has a wide background in litigation, negotiation and mediation of disputes. He is an accredited mediator of the Victorian Bar. Rob is an Adjunct Professor with Southern Cross University in NSW, is a member of various public sector audit committees including the audit committee of the City of Manningham and is a member of the Council of the Victorian Baseball Association. Rob was a part time judicial member with Victoria’s Anti Discrimination Tribunal [as it then was] for 4 years in the mid 1990’s. He remains actively involved in equal opportunity and discrimination law. Rob’s most recent publications include a series of articles on Water Law published in the Law Institute Journal and an extensive review of the tort of misfeasance in a public office published in the Australian Bar Review. He has published widely in other areas including administrative, discrimination, constitutional, university, and trade practices law and the law of economic torts.